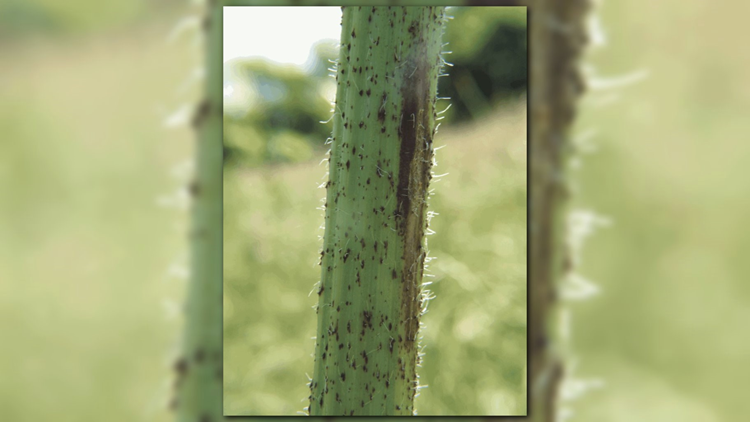 Hogweed is an invasive plant that can cause serious burns. King County noxious weed specialists removed a giant bush in West Seattle Tuesday. Hogweed is a noxious plant that can cause severe skin burns. The weed's watery sap makes skin sensitive to ultraviolet rays, resulting in painful skin blistering. 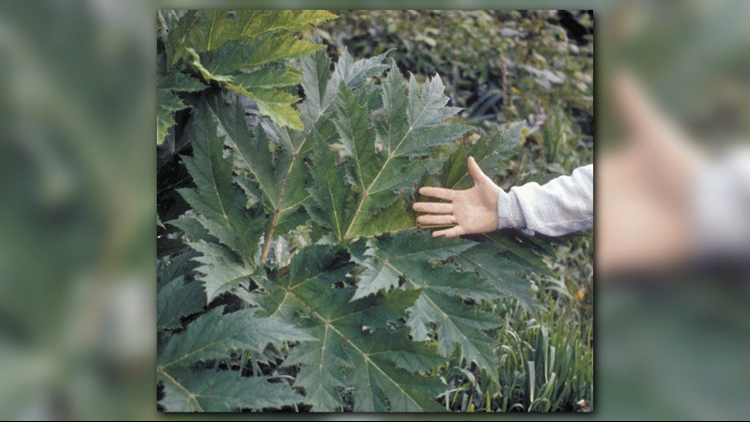 King County plant specialists removed a giant hogweed plant from a West Seattle yard Tuesday. 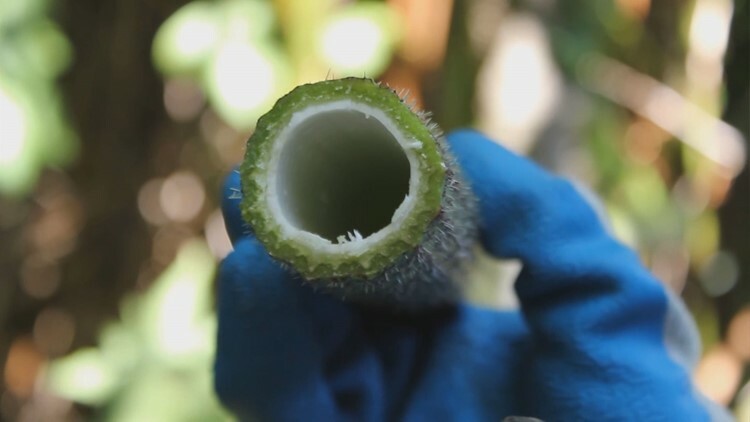 The plant's stem was nearly an inch in diameter — and highly poisonous. "Giant hogweed is an invasive plant that's been brought over from Russia and it causes these horrible burns and blisters on your skin. It's a really nasty sap that makes your skin hypersensitive to sunlight," specialist Sasha Shaw said. "Plus it makes a million seeds. We put them in the bag right here, but otherwise, it would've spread over this whole area." In 2006, King County estimated nearly 1,100 of the weeds were growing in the area. Crews cut that number to 414 in 2017. Recently, a 17-year-old boy from Virginia suffered massive burns on his face after coming in contact with the plant. "I wore gloves. I have long pants, long sleeved shirt. I just made sure I didn't get any sap on my skin," Karen Peterson said. Giant hogweed is a perennial distinguished by its large size, capable of growing to a height of 15-20 feet. It has stout dark reddish-purple spotted stems and leaf stalks. Stalks and stem produce sturdy pustulate bristles. Giant hogweed has broad, flat-topped flower clusters (umbels) of many small white flowers. Each flower cluster may grow to a diameter of 2.5 feet. The compound leaves of giant hogweed may expand to five feet in breadth. Each leaflet is deeply cut. The stem and stalks are hollow and vary 2 to 4 inches in diameter. The flowers produce large elliptic dry fruits marked with brown swollen resin canals. Cow Parsnip, Heracleum lanatum, is a native plant in Washington and except for its size, has a similar appearance to giant hogweed. Your county noxious weed coordinator can also help with identification. Giant hogweed may colonize a wide variety of habitats but is most common along roadsides, other rights-of-way, vacant lots, streams and rivers. Please click here to see a county level distribution map of giant hogweed in Washington. Reproduction is by seed and perennating buds formed on the crown and tuberous root stalk. Abundant seed production, a persistent root stalk, and reproduction from perennating buds are cited as reasons for its capability to colonize rapidly. The key strategy for this plant is to get rid of it before it sets seed. When controlling giant hogweed, make sure to wear protective clothing to avoid contact with its toxic sap.